This orientation course is meant to introduce learners, teachers, and higher education leaders to the Global Freshman Academy (GFA). We recommend you browse the course to learn about GFA, its mission, how it works, the courses that will be available over the coming months, and the outcomes we hope to provide to our learners. Click "See more" to view frequently asked questions. We are pursuing options to make financial aid available, but at this time it is not available to GFA students. Anyone can take these courses for ASU credit. However, if you’d like to apply them toward a university degree, you will most likely need your high school diploma or proof that you’ve passed the high school equivalency exam. This will also depend on the policies of the particular university to which you are applying. Is GFA for Freshman only? No. While GFA is perfect for incoming Freshman who want to enjoy a flexible, economically-viable model for taking Freshman-level courses, ambitious high school students who want a jump-start for their college career, or adult-learners returning to Freshman year after a hiatus, these introductory-level courses can be taken by anyone who wants to continue lifelong learning or by educators who want to share resources with students. Will GFA be extended to full college degrees? At this time, edX and ASU are focused on breaking down the barriers to successfully completing Freshman year. No. Your Verified Certificate is provided by edX to any student who completes an ID Verified course with a passing score (which varies, but will be clearly communicated via course materials) and will not feature a letter grade. Additionally, your Verified Certificate does not equal credit earned by ASU and you will still need to complete the steps required for credit conversion after you have earned the Verified Certificate. Will I get a letter grade on my Arizona State University transcript? Yes students who pursue the ID Verified track will receive a letter grade from ASU for the course and an official Arizona State University transcript if they pay the credit fee. Why is the estimated effort (18 hours per week) for these courses so high? As a tier-1 public research university, ASU courses reflect the rigorous standards faculty members expect of their students. Given this, ASU recommends that for a 7.5 week course, students should be prepared to spend 6 hours a week on coursework for every 1 course credit. So for a 3 credit course, you should expect to spend approximately 18 hours of coursework per week. To what extent can I use credits earned via GFA to apply for a university degree? Arizona State University is an accredited university. Credits you earn via Global Freshman Academy will appear on an Arizona State University transcript and can be used as transfer credits anywhere ASU credits are accepted. We recommend that you check with your university to see whether ASU credits are accepted. While having earned ASU credits before you apply to a university will not guarantee your admittance, we believe many universities will value the hard work you have already completed. University credits are typically recognized globally when they come from accredited institutions. Please check with your local university to see Arizona State University credits are accepted. After having taken a class and passed, what is the maximum allotted time to pay for the credit through ASU? You will be able to upgrade from a standard Verified Certificate to credit for one year after you successfully complete and pass the course. How will exam proctoring work? Students who have chosen the Verified track in the course will be asked to re-verify their ID upon launching any proctored exam in a GFA course. During a proctored exam, students will be monitored for the duration of the exam, and suspect behavior will be flagged and reviewed within 3-5 days of exam submission. A webcam will be required for proctored exams. Will GFA courses be offering any accommodations for people with learning disabilities? Especially during proctored exams? To see the most up-to-date list of courses offered by Global Freshman Academy, visit the Future GFA Courses section of the Welcome to Global Freshman Academy Course. If I fail a class in GFA, will it be reflected on my transcript? If you do not pass the course, you will not be eligible for the upgrade to credit. The failure will not appear anywhere on your ASU transcript. If I fail a GFA course, will I have the option to retake it at no additional cost? With the Global Freshman Academy, you only pay for the course credit once you receive a passing grade. If you need to retake a course, you can do so at anytime but will be required to again pay the $45 ID Verification fee. If I already know the material of a course offered via GFA, would I have the option to test-out and receive ASU credit? At this time, we do not offer an option to test out of the material offered in a GFA course. You will need to complete and pass all course material in order to be eligible for credit. Will you have courses in other subject areas? e.g., Education, Management, Psychics, Computer Science, etc. The Global Freshman Academy is a collection of freshman level courses that fulfill a specific set of general education requirements. The general studies focus areas will include Mathematical Studies, English, Humanities, Arts and Design, Social-Behavioral Sciences and Natural Sciences. To see the most up-to-date list of courses offered by Global Freshman Academy, visit the Future GFA Courses section of the Welcome to Global Freshman Academy Course. How do I transfer the credits that I might earn through GFA? Once you complete your course(s) and are ready to transfer the credit earned, you will simply request your official transcript from ASU and submit to the the university to which you are applying. I have previously earned credits from other universities. Can I still take courses through GFA? We would first recommend checking with the university of your choice, whether that is ASU or elsewhere, to see which of the credits you already have would transfer in and what freshman year classes you may still need to take. This will give you a better idea of what GFA courses you would find beneficial. 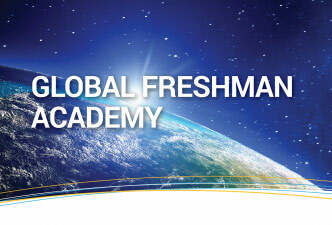 I believe that the idea of the Global Freshman Academy will change millions of people's lives worldwide !